What I love about bread is that we’re constantly learning. Let me introduce you to my friend Ali. 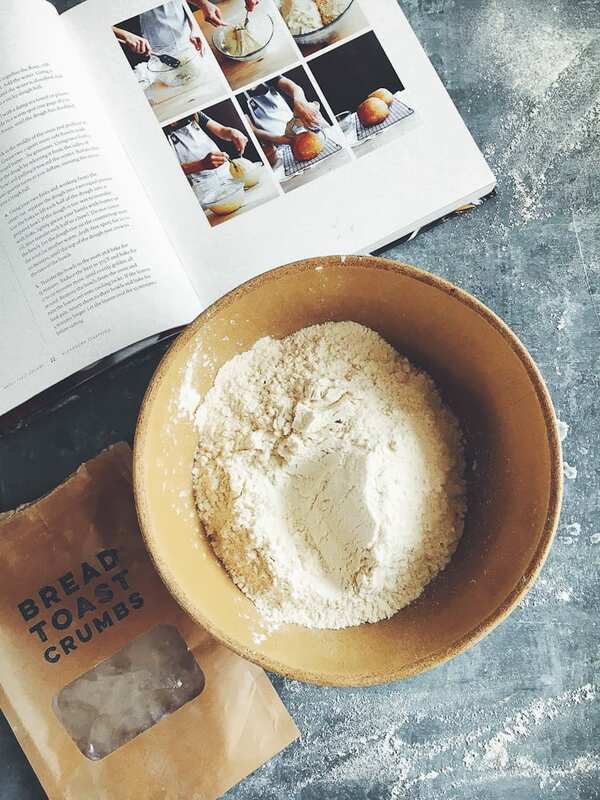 She’s the creator of Alexandra’s Kitchen, mother of 4 totally adorable cutie pies, and author of Bread Toast Crumbs: Recipes for No-Knead Loaves and Meals to Savor Every Slice. The book is just as fabulous as she is. 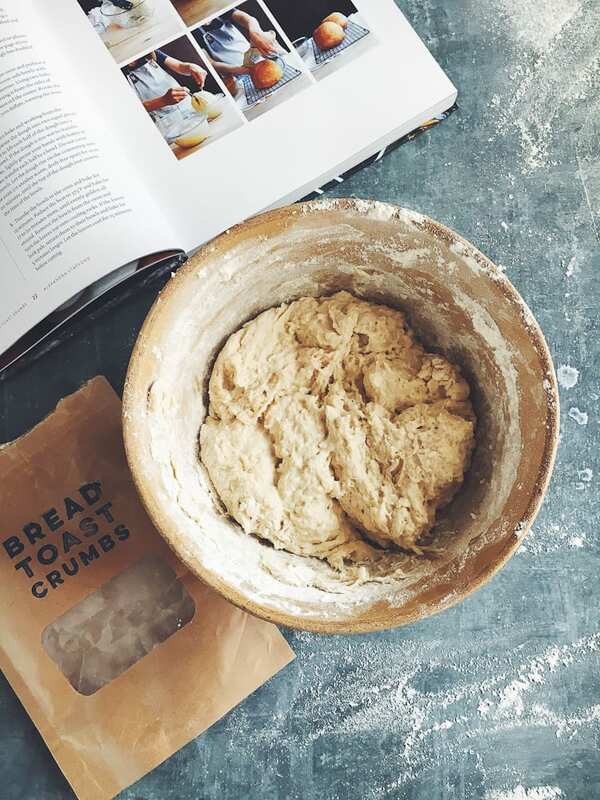 Ali’s story is based on her mother’s peasant bread which is an approachable, no-knead loaf that absolutely anyone can make. The dough is made with instant yeast, so you can expect for it to rise pretty quickly when left in a warm spot. Then it’s shaped and divided between two buttered bowls (BUTTERED!) and left to rise again for a short amount of time. When ready to bake (and this is the cool part) the doughs are baked to golden perfection directly in their happy little bowls. What’s practical too, is that her peasant bread is the gateway to many other breads in the book including this Oatmeal-Maple Bread and this insanely good-looking Cinnamon Sugar Monkey Bread. But as scrumptious as it all sounds, her mother’s recipe was passed down with a catch. She was forbidden to share it with anyone. And so for many years, she didn’t. Ali kept it a secret. Occasionally, the bread would make an appearance on her blog and naturally everyone wanted to know how to make it. Following her mom’s orders, she told the readers they could find the recipe on the back of a bag of King Arthur Flour. But this wasn’t really the case. Soon enough, her readers caught on and were too savvy to bite the bait. Ali couldn’t keep the secret for any longer! The recipe was eventually published on her blog and it was received with great success. The creation of Bread Toast Crumbs followed and the rest of the story is delicious, peasant bread history. I’m incredibly excited to share this recipe with you not only because I love bread, new methods, and fun techniques, but I’m inspired to support the work of a fellow bread baker and good friend. So let’s make some peasant bread, shall we? Okay, so first throw all the ingredients into a bowl. Ali was kind enough to send me a little starter kit which included the flour, sugar, salt, and yeast. All I had to do was add water. Easy! Once everything is in the bowl, give it a good mix until the flour is fully incorporated. You can mix the ingredients with a wooden spoon; I do it with my hands. 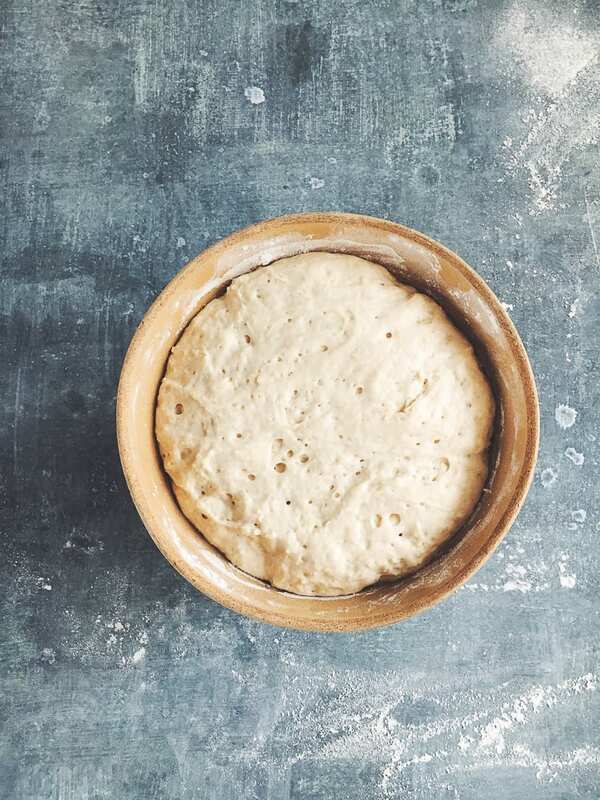 The dough will look wet and shaggy, or like cold leftover oatmeal (sorry!). Then cover the bowl with a damp cloth and let rise until about double in bulk size. Like my striped linen shower cap? This adorable accessory was also included in my starter kit and I love it. It fits perfectly over the bowl. Now, divide the dough between two buttered bowls and let rise again. You’ll know it’s ready the dough has risen just above the rims of the bowls. Then place the bowls directly into the oven and bake until golden brown. In the meantime, do yourself and favor and flip through the rest of the book. You’ll find all kinds of glorious recipes that you can make with her bread (fresh, day old- it’s up to you!). The possibilities are endless. Yum! Once the bread is ready, remove the bowls from the oven and invert onto a wire cooling rack. Cool for 15 minutes and then go ahead and dive in! I’ve said it before and I’ll say it again: baking bread is one of the most rewarding things you can do. 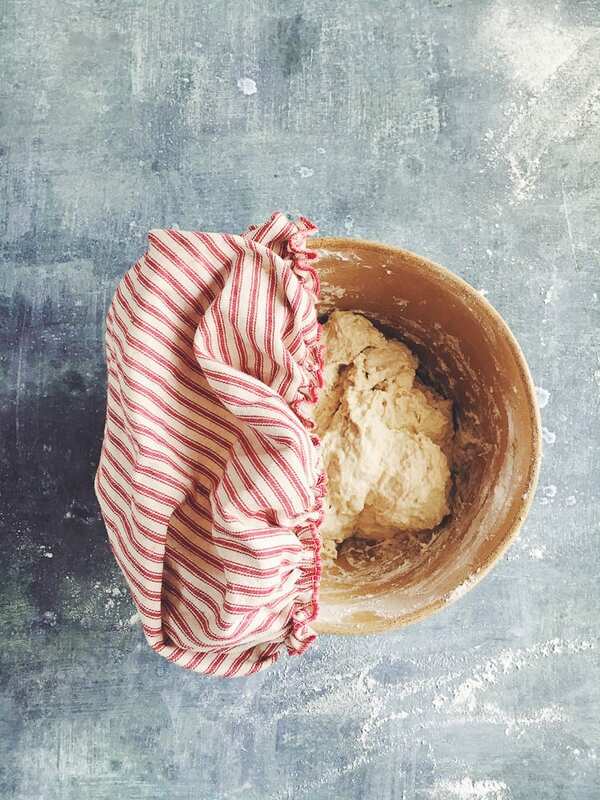 Whether it’s made with instant yeast or with sourdough, with a stand mixer or by hand, kneaded or not- it’s all about perspective. Bread is always one part recipe to one part baker and the magical combination makes the journey a beautiful and creative art. 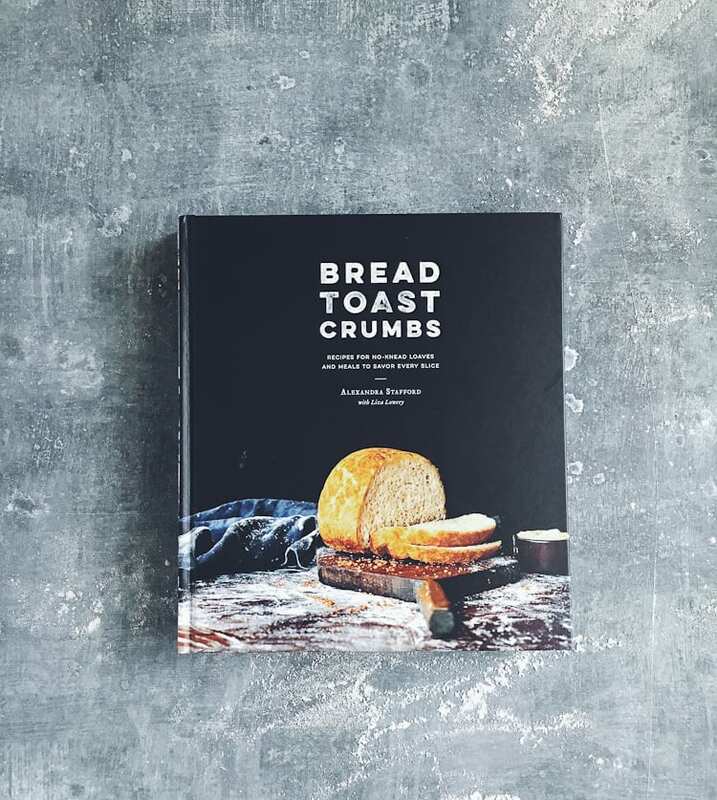 Bread Toast Crumbs is available wherever books are sold. Click here to grab a copy! Add the the flour, salt, sugar, and instant yeast to a large bowl. Whisk well to combine. Pour in the water and the mix thoroughly until all of the flour is fully absorbed. The dough will look (and feel) wet and sticky. Cover the bowl with a damp tea towel or plastic wrap and let rise in a warm spot until the dough has doubled in bulk size. This should take about 1 to 1½ hours or more, depending on temperature. Generously coat two 1-quart oven-safe bowls with the softened butter. Using two forks, gently loosen the dough from the sides of the bowl while coaxing it toward the center; it will deflate. Rotate the bowl quarter turns as you go, turning the dough into a rough ball. Divide the dough in half using your two forks. It helps to do this working from the center out. Then use the forks to lift each half into a coated bowl. Ali's tip: "If the dough is too wet to transfer with forks, lightly grease your hands with butter or oil, then transfer each half to a bowl." 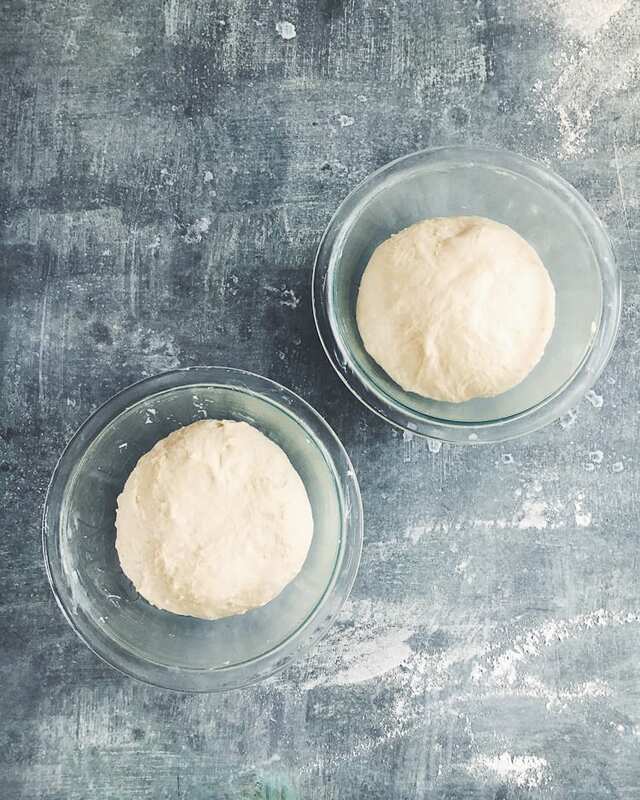 Let the dough rise at room temperature, uncovered, close to the oven while it's preheating. This should take about 10 to 20 minutes, or until the top of the dough has just risen above the rims of the bowls. Place the bowls onto the center rack and bake for about 15 minutes. Reduce the temperature to 375°F and continue to bake for 17 to 20 minutes or more, until the loaves turn golden brown on all sides. Remove the bowls from the oven and invert the loaves onto a wire cooling rack. If the loaves need more color, place them back into their bowls and bake for 5 more minutes, or until they're done to your liking. Cool for 15 minutes before cutting into slices. Enjoy! Ali's tip: "Many of the bread recipes here call for lukewarm water. What does that mean? Use 1 part boiling water to 3 parts cold water. For most, this means ½ cup boiling water and 1½ cups cold water. This trick will create perfectly lukewarm water every time—no need to take its temperature. If water is not specified as lukewarm, that means room temperature will do just fine." How would this work in a single 2 quart bowl? I only have a 1.5 litre bowl which is the closest size I have. Hi Elizabeth! Great question- According to pg. 16 of Ali’s book, you can use a 2-quart bowl for the peasant bread. Just make sure to bake it for 10 minutes longer. Hope this helps! This bread looks great. 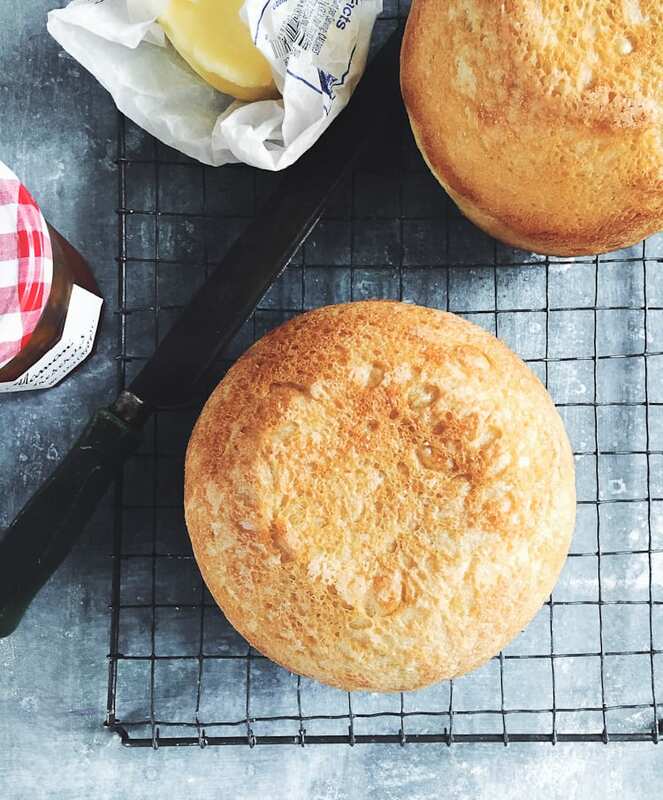 I’m a big fan of no knead bread but hadn’t thought to bake it in bowls. Definitely one to try. What is the advantage of using a glass bowl over a tin?